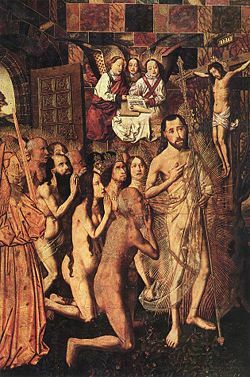 Christ Leading the Patriarchs to Paradise: Methuselah, Adam and Eve, and Solomon lead the procession of the righteous behind Jesus. Methuselah or Metushélach (מְתוּשָׁלַח - "Man of the dart," or alternatively "when he dies, it will be sent") was the longest-lived person in history, according to the Hebrew Bible. His genealogy in the Book of Genesis records him as the son of Enoch and the grandfather of Noah through Lamech. Although he and his progeny are specially singled out as worthy of mention in the ten generations from Adam to Noah, almost nothing is said about him other than his marvelous lifespan of 969 years. In the apocryphal Book of Enoch, Methuselah becomes a channel through which Enoch, already living in the heavenly realm, communicates to the people on earth, revealing various cosmic secrets and predicting the coming of Noah's flood. Various theories have been presented concerning Methuselah's reported long life, some considering him to be a figure of myth rather than history, and others explaining his longevity either with reference to various scientific theories or simply as a matter of faith. The name Methuselah has become a general synonym for any living creature of great age. If the biblical story is accurate, then Methuselah and his unnamed wife are the ancestors, through Noah and his wife, of every living human being. Methuselah is mentioned in Genesis as the son of Enoch and the father of Lamech, whom he supposedly fathered at the age of 187. He is thus also the grandfather of Lamech's son Noah. A close reading of the dates in the Old Testament reveals that Methuselah is said to have died in the year of the Great Flood, but the Bible does not say whether he was among those killed in the flood or whether he died of natural causes. The Death of Adam by Piero della Francesca. Methuselah had already been born at this time according to Genesis. The Bible indicates that Methuselah reached the age of 969 years (Genesis 5:27). According to this genealogy, Adam was still alive when Methuselah was born. This makes Methuselah the human link between Adam and Noah, the only person to have been alive in the time of both of them. It must be noted, however, that many do not take these dates literally, and some discount the biblical account of this period as mythological rather than historical. Other than the fact of his longevity and his distinguished lineage as the grandfather of Noah, Methuselah does not figure prominently in the rest of the biblical narrative. He engages in no dialog or action, and is mentioned outside of Genesis only in genealogical lists. Methuselah is mentioned prominently, however, in the apocryphal Book of Enoch, in which he is presented as the person chosen to convey Enoch's heavenly knowledge to those who will survive the Great Flood. Here new details are presented about Methuselah's family, including his mother, named Edna, and his brothers. Enoch, who has seen God and lives among the angels, reveals to Methuselah several dreams and visions describing many secrets of the universe, including the coming Deluge and the future Messianic kingdom (Chapters 83-85). Love uprightness and walk therein. And draw not nigh to uprightness with a double heart, and associate not with those of a double heart. But walk in righteousness, my sons; and it shall guide you on good paths. And righteousness shall be your companion (Ch. 91). The Book of Enoch also relates how, at the birth of the still unnamed Noah, his father Lamech becomes frightened at the sight of the boy's unnaturally white body and his uncanny ability to converse with God. Lamech flees to his father Methuselah and informs him that his grandson resembles an angel more than a child. Lamech further informs Methuselah that he has foreseen that a terrible accident will befall the earth during the lifetime of this child. He begs Methuselah to consult Enoch, who was already among the angels, and who consequently would know what was to happen. Methuselah accordingly goes to the ends of the earth to confer with Enoch. He learns that a flood will indeed destroy the world, and that only the new-born child and his future sons, three in number, would survive. Enoch also tells Methuselah to name the child "Noah," inasmuch as he would console the earth for its destruction (Enoch 106-107). Modern science puts the natural limit on current human longevity below 130 years. The oldest person documented beyond reasonable doubt, Jeanne Calment, died at 122. This being the case, Methuselah's lifespan has been a source of much speculation. 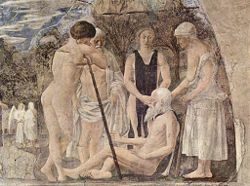 If one assumes that the age of 969 indicates months instead of years, indicating an early mistranslation or an inaccurate transmission in the oral tradition that preceded the written version of Genesis, Methuselah's age is calculated as 80.75 years, which is a more realistic lifespan. Another theory suggests that lunar cycles were mistaken for the solar "years." If this is the case, each lifespan from Genesis would be shortened by a factor of 12.37 and give ages for Methuselah and his contemporaries that resemble those of modern humans. However, objections to such life-shortening calculations have been raised on the grounds that, if reductions by these factors are carried out consistently, several ancient biblical fathers would have had children when they themselves were approximately five years old. One solution involving translation error is proposed by Robert Best, who suggests that inaccurate conversion between various ancient Sumerian numerical systems produced the ages of Methuselah, Noah, and their kin out of archaic Sumerian numerals. Best calculates that Methuselah's actual age would have been 85, and that he would have had his first son at age 17 (instead of age 187). Biblical literalists, on the other hand, have proposed several reasons that might explain a drastic decrease in the human lifespan after the Flood. The simplest of these is the fact that Gen. 6:3 says, "And the Lord said, 'My spirit shall not strive with man forever, for he is indeed flesh; yet his days shall be one hundred and twenty years.'" This is interpreted by some as a prophecy that humankind's lifespan would be gradually shortened over time. Thus, the patriarch Abraham and the prophet Moses both lived to be well over 100, while in the times of King David and his successors the ages of the kings generally were in the range of 40-70 years old. Some Creationists have speculated on the possible scientific reasons for the dramatic decrease in lifespans following the Great Flood of Noah's time. The Institute for Creation Research has posited that a "vapor canopy" surrounded the earth before the Flood, and that this was the source of the floodwaters. In this theory, such a canopy would also have protected humankind from the supposed aging effects of the sun's ultraviolet rays. After the dissipation of the canopy during the Flood, lifespans dropped rapidly to what they are today. Mainstream scientists have rejected the vapor canopy theory, asserting that it does not stand up to any scientific analysis. Young Earth creationist Carl Wieland alternatively speculates that the decline in lifespan was due to the of the drastic reduction in population due to the Flood, causing a genetic bottleneck in which the genes that were "coded for longevity" were lost. Another explanation for the rapid shortening of human life after the time of Noah is the introduction of meat into the human diet mentioned in Genesis 9:3. In this passage God says to Noah: "Everything that lives and moves will be food for you. Just as I gave you the green plants, I now give you everything." To Adam, God gave dominion over the animals, but apparently specified a vegetarian diet: "I give you every seed-bearing plant on the face of the whole earth and every tree that has fruit with seed in it. They will be yours for food" (Gen 1:29). ↑ Answers in Genesis, Ussher chronology. Retrieved September 29, 2008. ↑ Robert MacAndrew Best, Noah's Ark and the Ziusudra Epic: Sumerian Origins of the Flood Myth (Fort Myers, FL: Enlil Press, 1999, ISBN 9780966784015). ↑ James A. Borland, "Did People Live to be Hundreds of Years Old Before the Flood? Yes," in Youngblood (1986). ↑ Frank Steiger, Vapor Canopy. Retrieved September 29, 2008. ↑ Carl Wieland, for 900 years, Answers in Genesis. Retrieved September 29, 2008. Best, Robert MacAndrew. Noah's Ark and the Ziusudra Epic: Sumerian Origins of the Flood Myth. Fort Myers, FL: Enlil Press, 1999. ISBN 9780966784015. Georgakas, Dan. The Methuselah Factors: Strategies for a Long and Vigorous Life. New York: Simon and Schuster, 1980. ISBN 9780671240646. Youngblood, Ronald F. The Genesis Debate: Persistent Questions About Creation and the Flood. Nashville: T. Nelson, 1986. ISBN 9780840775177. Methuselah in the Catholic Encyclopedia. newadvent.org. This page was last modified on 19 September 2018, at 15:54.